Thankfully, any military scrapbooking layouts I've made feature relatives from many years ago. For other scrapbookers, their military page layouts are very much set in the present. 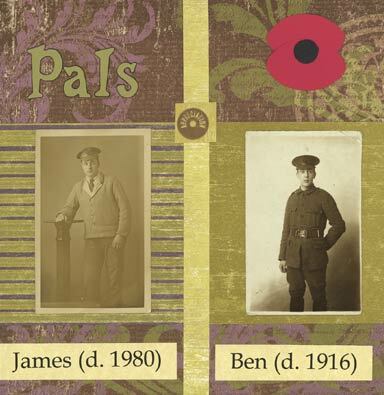 My page below is a tribute to my grandfather (on the left) who joined up with the Liverpool Pals in the Great War with his cousin (on the right). One returned to a full and happy life of children and grandchildren. The other didn't. His body was never found. This layout was a stretch for me because my inclination can be to overcrowd a page sometimes and make it too 'noisy'. The main embellishment is of course the poppy - from red and black 'Bazzill Basics' stock. The poppy is I feel an appropriate as well as welcome respite from the dominant military green. The best way to make a poppy is to cut two elliptical shapes and place them overlapping - it works better than cutting sections out of a circle. I tried! The title journaling is from Sissix lettering. The small round central embellishment - which you might not be able to read - says simply 'Appreciation'. This plus the lovely background papers I was given at a Sarah Beaman short workshop at London's 'Stitch and Craft' show. They are from K & C.